After a scorching May this year, the month of June, which is marked by the onset of monsoon, proved to be one of the driest for India since record keeping began over a 100 years ago. This was followed by a warning from the newly elected BJP government at the Centre about the possibility of a drought-like situation in western India, and directives to the states to roll out their contingency plans. The warning could not have come at a worse time. In a year when world economies are struggling to tame food inflation and the US, Australia and parts of Africa are trying to overcome prolonged droughts, the World Meteorological Organization (WMO) has issued a warning to prepare for an inclement weather. “An El Niño episode will continue to develop over the coming weeks and months. This will strongly affect the weather and the pattern of droughts and floods in many parts of the world. Countries must prepare carefully for the likely impacts, including on human safety, agriculture and fisheries,” warns Michel Jarraud, secretary-general of WMO. The weather fluctuation is not new. It returns at random intervals of two to seven years. The phenomenon begins as an abnormal warming of tropical eastern Pacific Ocean along the coasts of Peru and Ecuador towards April (see infograph). But no one knows why this happens. By December the warm Pacific currents alter the worldwide climate by hindering the flow of trade winds, which encircle the earth along the equator, blowing from high-pressure belts in the east to low-pressure zones in the west. The result is heavy rains and floods in South and North Americas, drought in South Asia and Australia, and mixed extreme weather events in Africa (see `Drought, flood and uncertainties'). 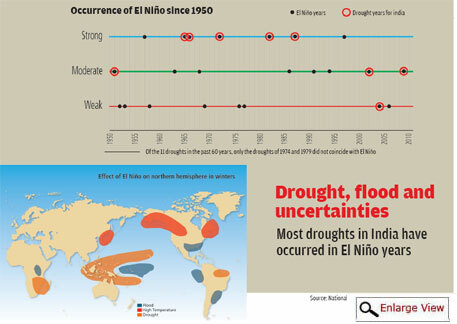 In India, El Niño is typically associated with patchy monsoon and drought. India Meteorological Department (IMD) has forecast a below normal rainfall during the summer monsoon. In a country where 60 per cent of farms are rain-fed, weak rains could lower agricultural output, resulting in a spike in inflation. This poses a major challenge for the country's newly elected government of Narendra Modi. Its four key Union ministries—agriculture, food, fertilisers and water resources—and state governments are frantically preparing to deal with any possible failure of monsoon. Contingency plans have been chalked out in 500 districts, where authorities are preparing nurseries for short-duration crops that can withstand low rainfall, issuing location-specific advisories and monitoring the situation closely. In the last decade, the country witnessed severe droughts in 2002, 2004 and 2009—all coinciding with El Niño years. In 2009, the worst drought in three decades led to high food inflation, which remains untamed. In fact, it became a major reason for the rout of the upa government. The governments of other countries bordering the Pacific Ocean are also on their toes. Australia has asked its livestock rearers to take to large-scale culling to cut down fodder and feed demand, and has issued a warning of a global shortage of beef. There is also a flutter in the global agricultural produce market. Cocoa prices have hit a three-year high because of fear of El Niño hitting crops. Food prices are also reaching their highest on the index of Food Agriculture Organization (FAO). The UN body has attributed the price rise to fear of El Niño. El Niño does affect global food production. According to a study published in Nature Communications in October 2013, El Niño affects 22 per cent to 24 per cent of harvested areas worldwide. But the prevailing fears mostly stem from the lack of understanding of the weather phenomenon. The problem is scientists do not really understand El Niño and cannot predict when the weather phenomenon, which lasts from eight months to over a year, will strike and with what vigour. Such uncertainty leaves both farmers and governments undecided about their future course of action. For instance, the El Niño of 1997-98 has been the strongest since record keeping of the phenomenon began in 1950. Indian scientists and the authorities were dreading a bad monsoon that year. Though the eastern Pacific Ocean remained warm till February 1998, it did not affect Indian monsoon. This year, till this magazine went to press, IMD, National Oceanic and Atmospheric Administration (NOAA) of the US and the Bureau of Meteorology of Australia had predicted 70 per cent chances of El Niño getting stronger during summer monsoon. NOAA had also predicted an 80 per cent chance of El Niño getting stronger towards the winters, while the European Centre for Medium-Range Weather Forecasts (ECMWF), an intergovernmental agency, put the chances at 90 per cent. Strength of El Niño also remained uncertain. “It could be large or small, or more likely moderate,” Tim Stockdale of ECMWF told Down To Earth. Given the fallouts of El Niño, economical, social and political, weather agencies around the world have employed most advanced technologies like satellite observations and weather buoys and keep a paparazzi-like watch for the climate phenomenon. The US has even deployed ships in the El Niño formation area for real-time measurement of any anomaly in the sea surface temperature. “Yet we have hardly moved much since the British scientist Gilbert Walker provided the first clue of El Niño in early 1900s,” says Balaji Rajagopalan, professor of civil, environment and architectural engineering at the University of Colorado, US. It was during his posting with the East India Company as director-general of Indian Meteorological Services from 1904 to 1924 that Gilbert Walker understood El Niño, or the Baby Jesus as dubbed by the Peruvians, at the global level. The first reference to El Niño was made in 1877, when the entire southern India, which then comprised Madras, Mysore, Hyderabad and Bombay divisions, faced a severe drought. At least 6 million people had died that year. Though the deaths were largely attributed to the British policies, the severity of the drought had prompted people to look beyond the immediate shores of India. Yet another severe drought gripped India in 1899. China, southern Africa, Brazil and Egypt were also grappling with droughts around the same time. To understand this corelation, Walker and his team sorted through weather records, and found some patterns of unusual warming of tropical eastern Pacific Ocean which could be associated with Indian monsoon and simultaneous droughts and floods in various parts of the world. He also noticed that an oscillation in atmospheric pressure between the eastern and western Pacific is at work in tandem with El Niño. He named it Southern Oscillation. His work on El Niño-Southern Oscillation (ENSO) is considered seminal. It was only decades later that scientists were able to prepare weather models to forecast El Niño. In a normal year, tropical eastern Pacific heats up around April. Simultaneously, air pressure builds up over Tahiti island on the east and low pressure forms over Darwin of Australia on the west. This pressure difference encourages the movement of trade winds from east to west. The winds carry precipitation from the warm eastern Pacific. On the way they shed some water on Australia and move towards Asia, where they feed the monsoons. In an El Niño year, sea surface temperatures of the eastern Pacific become unusually high for reasons that are not fully understood. Trade winds also slow down around the same time. As a result, they fail to deflect the warm ocean currents forming near the Peruvian coast and heat up the entire atmosphere. The precipitation, too, is not transferred, bringing floods in the South American continent. Scientists say the two processes of ENSO exhibit a strong interaction, but they are yet to decipher what triggers their simultaneous occurrence. This gap in knowledge impairs the prediction of El Niño. Consider this. The premier agency for predicting and monitoring El Niño, NOAA has divided the tropical eastern Pacific into four localities—Nino 1+2, Nino 3, Nino 3.4 and Nino 4—and monitors differences in their sea surface temperature (sst). If the average sst anomaly for three consecutive months at Nino 3.4 exceeds 0.5°C, it indicates onset of El Niño. sst anomaly is the difference between the current temperature of sea surface and the normal expected temperature. It must continue for five such periods for weather agencies to declare it an El Niño episode. In December 2013, NOAA predicted that the sst anomaly for March-April-May would be 0.62°C. This showed a strong possibility of El Niño. But the value decreased to 0.24°C in its predictions released in March. The actual sst anomaly for the period, released in May, was -0.2°C. If the anomaly decreases beyond -0.5°C, it leads to La Nina conditions. La Nina is the colder phase of ENSO during which trade winds continue to blow from the east to west, but making the cool water colder than usual. 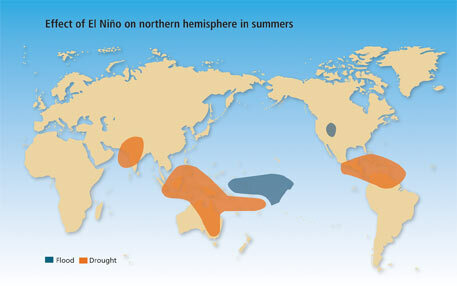 Unlike El Niño, La Nina is often associated with more rain in the western Pacific and a bountiful monsoon in India. There is no consensus among scientists over current sst anomaly data, let alone future data. In January this year, the sst anomaly of Nino 3.4 released by NOAA was - 0.51°C, while the figures released by Australia's Bureau of Meteorology (bom)was 0.26°C. This clearly shows that the top scientists of the world are still struggling to decipher El Niño. “This difference may be due to different sst data and different base periods used for calculating normals and anomalies,” explains M Rajeevan, scientist, Ministry of Earth Sciences and head of Monsoon Mission of India. bom uses sst anomaly data from 1949 till present, while NOAA uses long-term monthly mean data for determining values of sst and uses the value to conclude the current anomaly. Besides, these agencies use 15 dynamic models (that involve 3D mathematical simulation of the atmosphere on computer) and eight statistical models to forecast El Niño. Prediction has become more difficult this year because of a peculiar condition, says Rajeevan. “This year both Nino 1+2 and Nino 3.4 are showing El Niño signs.” If the signs emerge stronger at Nino 3.4, then the Indian monsoon will get affected. Stronger weather conditions at Nino 1+2 will cause floods in South America, but will not affect India, he adds. A similar phenomenon was seen during the El Niño of 1997-1998. While Nino 3.4 region was showing unusually high sst anomalies, Nino 1+2 showed even higher sst anomalies. In fact, sst anomaly for Nino 1+2 lasted till August of 1998. The region had not shown such high anomalies since January 1982. Scientists at the Indian Institute of Tropical Meteorology (IITM) in Pune in 2007 analysed El Niños evolving in the two regions. “There are two flavours of El Niño—the one at Nino 3.4 is called El Mdoki and the other at Nino 1+2 is called El Niño,” says Ashok Karumuri of IITM. “Mdoki has a worldwide impact while El Niño impacts only South America, especially Peru." The analysis is still to be recognised by agencies like NOAA. Maybe an understanding of their difference could have helped predict El Niño 2014. High unpredictability associated with El Niño has evoked curiosity among amateur weather forecasters. Ashok M Patel from Rajkot, Gujarat, predicts weather for his area. A chemical engineer by degree, he pursued his hobby with the advent of Internet. Almost all weather related data are available on websites of different agencies for free. “So far, no weather condition indicates onset of El Niño this year,” he says. While weather forecasters debate over the probable occurrence of El Niño, there is no denying the fact that the weather event will only strengthen and become frequent in future. The frequency of El Niño will double in times to come if the current rate of global warming continues, says a January 2014 research, published in Nature Climate Change. The researchers, led by Wenju Cai, a climate modelling expert at Commonwealth Scientific and Industrial Research Organisation (csiro), Australia’s science agency, examined 20 climate models, used by the Intergovernmental Panel on Climate Change. Seventeen of these models showed that the frequency of El Niño events has increased in the past two decades. Climate modelling for future showed that extreme El Niño events will double by 2090. The researchers said increased frequency is the result of surface warming over the tropical eastern Pacific that occurs faster than the surrounding waters leading to more frequent atmospheric convection in the eastern equatorial region. Meher Engineer, physics professor at Bose Institute, Kolkata, says the most intriguing part in the formation of El Niño is the reversal of trade winds. Such a phenomenon is not noticed in any ocean other than the Pacific, which occupies the maximum equatorial area. “Something is disturbing the ocean currents under the sea surface giving rise to ENSO. This needs to be studied,” he adds. Drought or no drought, El Niño cannot be always blamed for the vagaries of Indian monsoon. This is for a simple reason that there are several other parameters, some of them regional, that influence the monsoon. During the El Niño of 1997-98, a phenomenon similar to ENSO developed in the Indian Ocean and instilled vigour in the monsoon. The phenomenon, called Indian Ocean Dipole (IOD) or Indian Nino, has its poles in the Arabian Sea and Indian Ocean on the south of Indonesia. High air pressure in the Indian Ocean and low air pressure in the Arabian Sea give IOD a positive value and push precipitation towards India. IOD was discovered in 1999, though evidence from fossil coral reefs suggests its existence for more than 6,000 years. “This strong positive iod in 1997-98 mitigated the impact of one of the strongest El Niño of recorded history,” says Balaji Rajgopalan, professor at University of Colorado, the US. IOD also impacts weather of countries on the rim of Indian Ocean, like Australia and South-East Asia. A similar phenomenon called Tropical Atlantic SST Dipole protects the region around Atlantic from the impact of El Niño. Another such phenomenon is the Equatorial Indian Ocean Oscillation (equinoo). A favourable equinoo or favourable convection over euatorial Indian Ocean may mitigate the impact of El Niño. On the other hand, certain cyclones that periodically form in the Arabian Sea can adversely affect the progress of monsoon over India. 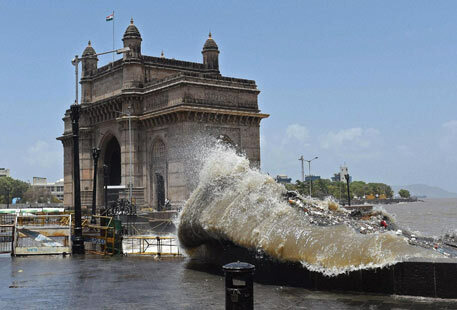 Cyclone Nanauk that made a landfall on India's west coast on June 15 and then moved away towards Oman, stalling the movement of monsoon from coastal area towards the interiors, is one such example. Recently, South Asian Climate Outlook Forum (SASCOF), which consists of India, Bangladesh, Bhutan, the Maldives, Myanmar, Nepal and Sri Lanka, recognised the role of many other regional and global factors on the monsoon rainfall patterns. In April, at their fifth conference at IITM, SASCOF issued a statement, saying apart from ENSO and iod, snow-cover over the northern hemisphere is an important parameter that affects rainfall and hence can help predict it. It has predicted below normal to normal rainfall for the 2014 monsoon season (June-September) over the region. Explaining why El Niño cannot help predict Indian monsoon, Ashok Karumuri of IITM says, “El Niño begins to evolve around the same time as Indian monsoon but continues till much after the monsoon ends. In fact, Indian monsoon is a good indicator of the impact of El Niño over the winter weather of North America. “The phenomenon needs to be understood for larger weather patterns, not particularly for our monsoon,” he adds. There are many still who believe El Niño is the major deciding factor for Indian monsoon. 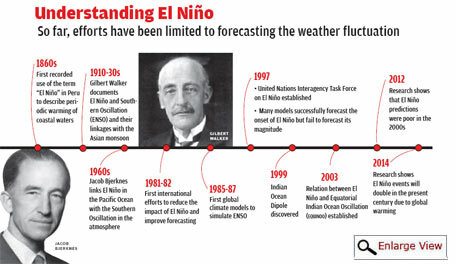 “We, as a forecasting agency, believe that we need to place a lot of emphasis on El Niño in our modelling for weather forecast,” says Jatin Singh, chief executive officer of Skymet, a private weather forecasting company in Delhi. “Analysis of the past 13 droughts in India shows that 10 of them have strong correlation with El Niño,” he adds. His agency uses models and data from various agencies like NOAA, IMD and Japan Meteorological Agency. Skymet assigned 50 per cent weightage to El Niño in its monsoon prediction released in April. It has been historically seen that neither all droughts in India were in El Niño years, nor all El Niño years led to drought. “In fact, it was La Nina in 1974 when India faced severe drought,” says Shweta Saini, consultant with Indian Council for Research on International Economic Relations (ICRIER), a think-tank. However, a correlation between the two seems to be strengthening. Since 1980, all droughts in India have occurred in El Niño years. In the 2000s the correlation became stronger (see `Occurrence of El Niño's since 1950'). Saini explains further: There is a peculiar link between El Niño and Indian monsoon. The years in which sst anomaly existed from April to October, India faced drought. An El Niño due to anomalies in other months did not result in drought in India. Saini, along with Ashok Gulati, professor for agriculture at ICRIER, has prepared working paper which analyses NOAA data from 1950 to 2013. As of now, IMD gives El Niño nearly 65 per cent weightage in its monsoon prediction. It is in fact shifting from statistical to the advanced dynamic models for better inclusion of El Niño related data. Is India prepared for an El Niño year? This year, El Niño's effect on the Indian monsoon may become evident towards the later part of the season. Food will not be a problem if the government distributes stored grains, says Arindam Banerjee, assistant professor of economics at Ambedkar University, Delhi. As of June 1, 2014, total stock of wheat and rice stood at 62.23 million tonnes, which is much above the target of 25 million tonnes for the country. "The government may consider expanding the public distribution system that provides subsidised food only to those belonging to bpl category to ensure access to food for all in crisis time,” he suggests. But this is only a short-term solution. Given the unpredictability of El Niño, the government must plan long-term strategies. Nagraj Adve, member, India Climate Justice, a collective of social movements for climate justice, shares momories of the 2009 drought. In one instance, he saw the entire Mahoba railway station packed with agricultural labourers leaving Bundelkhand. As the groundwater level had gone down, women had to pump tubewells for about an hour to draw water. “We need to develop alternatives like small dams and watershed to avert such crisis,” Banerjee suggests. It is popularly said that monsoon is the chief finance minister of India. 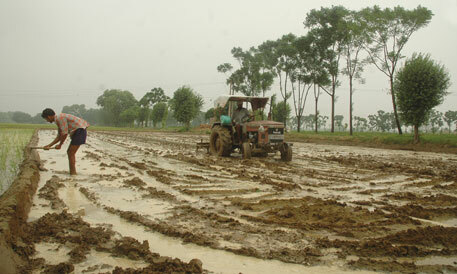 This time both the monsoon and Narendra Modi have tough challenges in hand. Who leads the intimate dance of El Nino with the Indian monsoon? El Nino and La Nina are part of Southern Oscillation. Southern Oscillation is part of our study when we were students. This is not a new phenomenon. This is a part of 50-70 years [60-year] Pacific Decadal Oscillation. This is a part of hemispheric and regional general circulation patterns. The same is reflected in rainfall, hurricanes and typhoons. 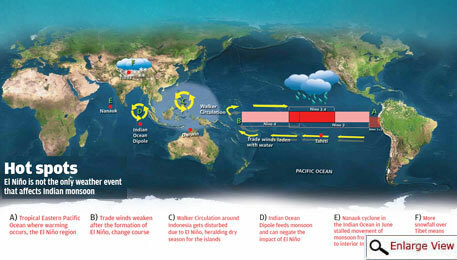 The WMO Secretary General on WMO Day [23rd March] issued a note on extreme weather events in 2013. In this note they made a statement: 2013 was warm and dry in the Southern Hemisphere nations. This is in association with human actions. Unfortunately, they made this statement casually with analyzing the data at least published information available in the WMO library. During 1970s and 80% I presented analysis of precipitation data from Brazil, South Africa, Botswana and Mozambique. Though they presented different cycles -- 52 to 66 years -- they extrapolated trend -- showed in the publications -- 2013 comes under below the average pattern. Temperature follows wet and dry conditions. Thus 2013 was warm and dry -- you can find this by comparing annual rainfall with annual temperature of India, which I did. In the case of 2002, 2004, 2009 only 2002 was El Nino year and 2007 was El Nino year [this was publicized by UN agencies]. Majority of the deficit rainfall El Nino years are part of the below average rainfall 30-year period of 60-year cycle. All the deficit rainfall years are not El Nino years. During the above the average 30 year period of 60-year cycle only 2 to 3 years comes under deficit rainfall years [< 90% of average] and the same during below the average period is around 7 to 10 years. Let me give a simple example: What ever may be the condition, when there is a low pressure system, in and around Hyderabad will be dry & warm. This is the general pattern that help the forecasters. It is important develop our system of forecasting instead of giving hype to Western reports. Also, develop our water and agriculture systems accordingly. Other-wise it help business interests only. I think the best we, as common citizens of India, can do is to avoid over-consumption and wastage of India. We must think about the poor farmers every time we waste food this season, and must be mindful in our eating habits. Besides, we must take action to prevent climate change which might accelerate the phenomenon in future. Sorry I meant 'wastage of food'.